Last week, Edgar's employees convinced him to roll his entire 401k into the Facebook IPO. While Edgar should certainly know the basics of the field he's managing, part of me feels for him. This could go in Forkum's Automotive Report. Do I really need my helix filters flushed? er... rebalanced? There are those in the quantum engineering field that insist the Galaxo 3000 Nano Accelerator was overrated in its '11 debut and should be recalled summarily. That Edgar, what an idiot. 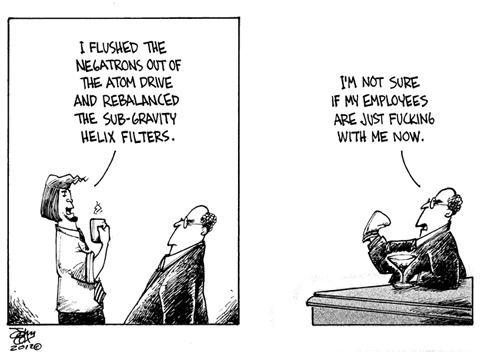 Everyone knows that sub-gravity helix filters are self calibrating and don't need to be balanced. Why just yesterday I was setting up redundant virtual i/o servers on a Power Systems box to have three logical partitions sharing a single RAID5 storage pool, a vrrtualized DVD drive shared by all LPARs, with 1Gb virtual ethernet bridges to a pair of physical NICs. Gotta love the hypervisor that enables this. Didn't want to go with Fiber Channel over Ethernet attached storage as the storage area network architecture configuration was an unnecessary complication. "What if they are? The pen held by the elitist nepotist that signs the checks, the promotions, & the pink slips is mightier than the snark..."
... (regardless of how much insight it may provide). Believe it or not, it's a real project - none of it is made up - although it will take more than a day to complete. The cartoon could have been a real project. All he's saying is that he discharged static electricity & straightened filters that catch airborne (or floating waterborne) particles. Sounds a whole lot better than "I cleaned the water cooler, boss." Hey now, that static electricity is also known as lightning, and the helix filters dampen tornadoes, so let's give the guy some props. Dr. Bob! Finally, someone I understand. If the employees' job descriptions included harnessing lightning & taming tornadoes, the boss wouldn't think his employees were effing with them for telling him they were doing their jobs--& if they actually could do it & it wasn't in their job descriptions, they wouldn't obscure what they were saying with technical jargon. This page contains a single entry from the blog posted on May 25, 2012 8:31 AM.